In addition to a high level of information on overall health of the environment, you can also enable alerting. To do this, you have to enable SMTP reporting on the UI appliance, as you did when installing and configuring vCenter Operations, and complete the following steps. 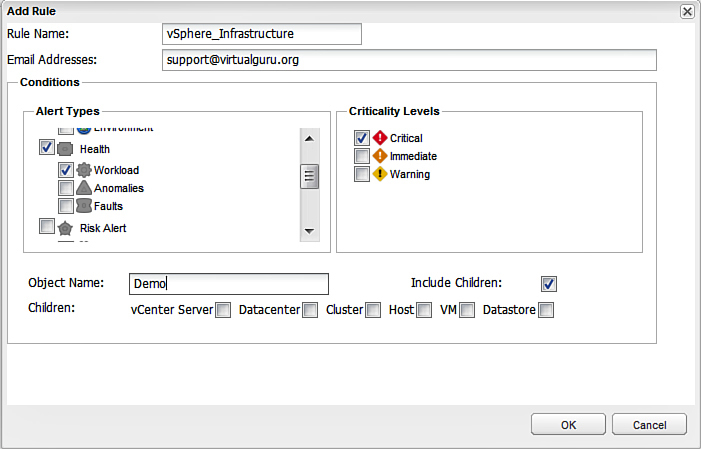 Open vCenter Operations and select the Notifications link on the top right (see Figure 22). Click the Add Rule icon and specify a descriptive name for the rule and e-mail address it should go to. In the Conditions, select the type of condition. In this example, I specified Health and specifically critical Workload and Faults. In addition, I set the Object level at the cluster and included all children of the cluster. Children of an object are objects that appear at a lower level in the object tree. In this case, rather than all child objects, I specifically selected Host. After configuring the alert (see Figure 23), click OK and then OK again to have the rule go into effect. 1. Ensure you are using group addresses versus individual e-mail addresses. 2. Be specific in what you are alerting on and where you would like the alerts to go. 3. Ensure that the team members whom you are sending alerts know how to take control of the alert in the console. Taking control of an alert lets everyone know that someone is working on the issue. To take control of an alert, from the right panel, select Alerts, the alert you would like to take control of, and click the Take Control icon (see Figure 24). When prompted to answer Yes or No, select Yes. Figure 24. Take control of alerts.